We continue to monitor the seventeen-year cycle in the US Dollar Index and its relationship with gold. 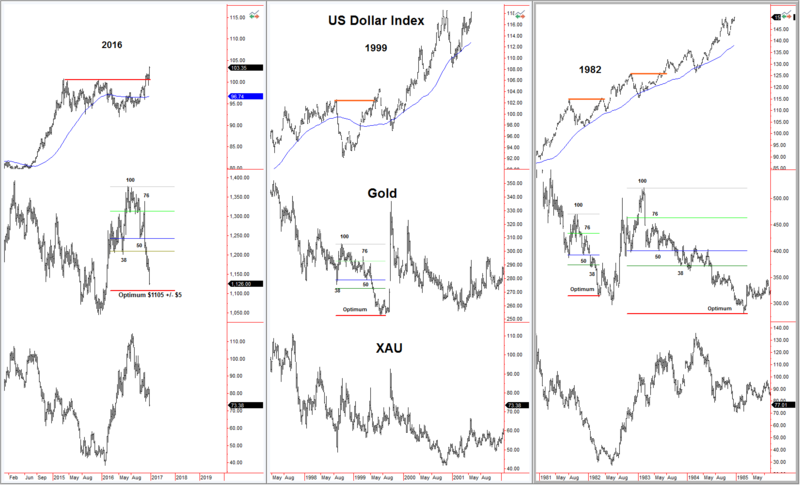 Looking at gold since the Dollar bottomed in May, the patterns of 1999, 1982 and 1983-85 are a close match. The Fibonacci levels come into play in each instance. The October 7th low at $1242 (labelled level 50 on the chart) was the last support before gold broke the May 31st low of $1199. It is deemed to become the midpoint of the eventual decline. The resistance level at 76% was a test of the previous support around $1310 during the summer. April and May become the 38% level in the pattern. The measured range for the downside move is $1105 +/- $5. The sharp rallies out of the 1982 and 1999 bottoms were event driven; August 1982: Volker buys $3 billion of Mexican bonds to protect US financial institutions from a sovereign debt default following a 20% decline in oil prices. September 1999: The “Washington Agreement on Gold” was created in response to the UK treasury announcement of its intention to auction off 58% of its gold reserves. 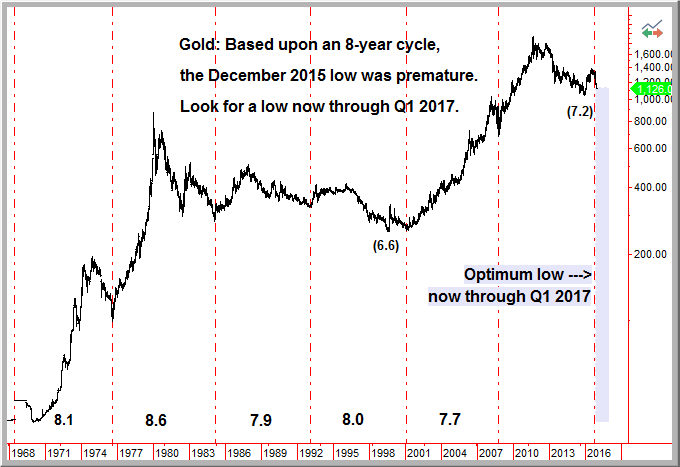 The February 1985 bottom coincides with gold’s eight-year cycle low and sees a methodical rise from $283 to $500 in a span of thirty-four months. of the 1982 and 1999 bottoms. The rally out of 1985 was 36%. Downtrends in December generally see a bounce before heading into a bottom. This month has been a disappointment. A drop to $1105 may provide a bounce for nimble traders before a move into a January/February low. Let’s watch for basing activity in the coming weeks. Tax loss selling in the miners should also be viewed as an opportunity to find bargains in the next two weeks. Opinions in this report are solely those of the author. The information herein was obtained from various sources; however, we do not guarantee its accuracy or completeness. This research report is prepared for general circulation and is circulated for general information only. It does not have regard to the specific investment objectives, financial situation and the needs regarding the appropriateness of investing in any securities or investment strategies discussed or recommended in this report and should understand that statements regarding future prospects may not be realized. Investors should note that income from such securities, if any, may fluctuate and that each security’s price or value may rise or fall. Accordingly, investors may receive back less than originally invested. Past performance is not necessarily a guide to future performance. Neither the information nor any opinion expressed constitutes an offer to buy or sell any securities or options or futures contracts. Foreign currency rates of exchange may adversely affect the value, price or income of any security or related investment mentioned in this report. In addition, investors in securities such as ADRs, whose values are influenced by the currency of the underlying security, effectively assume currency risk. Moreover, from time to time members of the Institutional Advisors team may be long or short positions discussed in our publications. Bob Hoye is the chief financial strategist of Institutional Advisers.